Disciples of Christ for Peace was founded on 9th November 1998 by Acharya John Sachidanand (now Swami Sachidananda Bharathi) and Most Rev. Dr. Samineni Arulappa, the then Archbishop of Hyderabad, as a 'Consecrated Society' within the Catholic Church. The original aim of DCP was to promote unity and peace in India based on the Fundamental Duties of Indian citizens as given under Article - 51 (A) of the Constitution. The 'Dharma Bharathi Ashram' was started at Mulanthuruthy village in central Kerala in December 2003 as a 'mother-house' for members of DCP in a 1.72 acre plot of land gifted by Sri. Francis Iype & Smt. Pushpa Francis for this purpose. The registered Trust Deed of DCP and the books titled ‘A Vision & a Mission for the Third Millennium’ and ‘An Indian Face of the Christian Faith’ authored by Swami Sachidananda Bharathi will serve as ‘reference manuals’ for members of DCP. Promoting ‘Peace & Value Education’ for national regeneration and global peace, and establishing a network of autonomous ‘Dharma Bharathi Institutes of Peace & Value Education’ at different parts of India and the world, and developing them into a ‘Dharma Bharathi Global Open University’ (DBGOU) for providing a strong spiritual and moral foundation for a culture of peace in the world constitute the basic vision and mission of DCP. The Dharma Bharathi National Institute of Peace & Value Education (DBNI) started in 1993 at Indore, M.P, and functioning at present from Dharma Bharathi Ashram, will provide the necessary support and orientation for members of DCP for realizing their basic vision and mission. A ‘Dharma Bharathi School of Forgiveness & Reconciliation’ (DBSFR) was started in Dharma Bharathi Ashram in 2006 on a temporary basis as a ‘training institute’ for future members of DCP. In January 2011 it was decided to shift DBSFR from Dharma Bharathi Ashram to Viswa Jyothi Ashram, Kunathur Village, Dharmavaram Mandal, A P- 515671. The Viswa Jyothi Ashram which has 10.6 acres of land at its disposal is bequeathed to DCP by its founder, Mother Elizabeth Jyothi for establishing DBSFR on a permanent basis there. A Training Center of DBNI will also be established in the Viswa Jyothi Ashram for providing training to DCP members in ‘Peace & Value Education’. 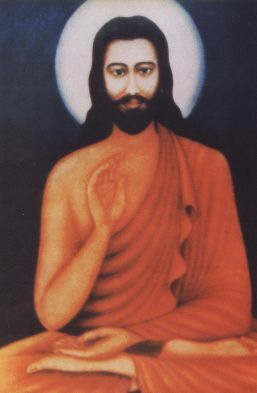 “Not everyone who says to me, ‘Lord , Lord’ shall enter the kingdom of heaven, but he who does the will of my Father in heaven.” - Sadguru Jesus Christ ( Mt. 7.21) ‘Spirituality’ for DCP members implies being inspired, empowered and guided by the living Spirit of Christ. ‘Applied Spirituality’ in the context of DCP means initiating various movements and campaigns, and taking up concrete activities for peace within and among people in the present world inspired by the forgiving, enduring and self-sacrificing love of Sadguru Jesus Christ. Abiding peace within individuals and families through forgiveness and reconciliation is the ‘seed’ of a lasting culture of peace in the world. Hence, ‘Forgiveness & Reconciliation’ will always have to remain as the ‘core ministry’ of DCP. ‘Peace & Value Education’ will continue as the most important public ministry of DCP. In the contemporary Indian context the ‘applied spirituality’ of DCP has given birth to a ‘Second Freedom Struggle’ for a hunger-free, caste-free and corruption-free India. This historic movement was initiated on 30th January 2008 from Kanyakumari. ‘Enlightened National Politics’ & ‘Hunger-free India’ are the two important Public Campaigns already launched to achieve the goal of the Second Freedom Struggle of India. ‘Pilot projects’ are also being initiated as part of these Public Campaigns. A pilot project of ‘Enlightened National Politics’ is being taken up in Kerala by Dharma Rajya Vedi to transform this most literate state in India into a ‘Chaitanya Keralam’ built on the four corner stones of Liquor-free Family, Panchayatiraj Democracy, Value-based Education and Corruption-free Governance through a decentralized and value-based federal democracy. A pilot project of ‘Hunger-free India Campaign’ is being taken up by Dharma Bharathi Mission in the Vidarbha region of Maharashtra state. Promoting the inter-religious sadhana of Tyagarchana and establishing a network of Mathrubhavans with the money saved through the Tyagarchana programmesto provide one nourishing vegetarian meal and one hour of value education with love to all poor and hungry children in Nagpur district below 14 years of age constitute the two-fold objectives of the ‘Nagpur Pilot Project’. Inspired members of DCP are called to take up these initiatives as important ‘contextual ministries’ and work selflessly, tirelessly and fearlessly for their success so as to bring down ‘showers of divine blessings’ upon Kerala and India. The name Viswa Shanti Peetam’ means ‘seat of universal peace’. It is envisaged to be an international pilgrimage center with Sadguru Jesus Christ as its ‘Peetaadhipathi’. The ‘Peace of Christ’ that comes from forgiveness and reconciliation is the spiritual treasure that all pilgrims to ‘Viswa Shanti Peetam’ will receive. ‘Viswa Shanti Peetam’ will be established on top of a picturesque hill at a suitable location in Kerala, the cradle of Christianity in India. A ‘Viswa Shanti Kendra’ will be established at the foot of the hill as a ‘base station’ for the peace pilgrims who will climb up to the ‘Viswa Shanti Peetam’ on foot. There will be various ‘Kshetrams’ (meditation centers) on the way. The pilgrims are also expected to lead a life of abstinence and prayer for 40 days as preparation for their pilgrimage to bear abundant fruits. Funds and resources for the ‘Viswa Shanti Peetam’ will be mobilized from donors (any amount), sponsors (Rs. 2 lakhs) and patrons (Rs. 10 lakhs). Payments are to be made by Cheques / DDs / direct remittance to ‘Navasrushti International Trust’ which is the registered Trust responsible to mobilize and provide funds for the Viswa Shanti Peetam and other projects of DCP. Donations to NIT are eligible for IT rebate under Sec.80 / G.